Jack is a journalist in search of a story. It’s 2003 and Iraq is grabbing all the headlines. However, a set of circumstances finds him considering a story set in the Middle East that does not involve conflict. Enter Mike’s Place, a haven for the young and young-at-heart to unwind and enjoy good spirits and great rhythm and blues right off the beach in Tel Aviv. It will be a decidedly odd twist of fate that places Jack in what proves a most compelling story of conflict, and unbridled optimism. Building upon their work on the documentary, “Blues by the Beach,” Jack Baxter and Joshua Faudem have taken what they placed on the screen and reworked it for the comics medium. Along with the thoughtful and energetic art of Koren Shadmi, you have a narrative that naturally flows with a life of its own. Shadmi has carefully developed believable characters that the reader hooks into. This is a story, as the cover makes clear, about a bombing. But not only about a bombing. But, how then do you make sense of it all if you’re constantly moving on? Well, you don’t completely forget. It seems that a story like the one about Mike’s Place becomes more powerful with each revisit. It seems that Baxter and Faudem had to process what they experienced and recorded into two separate mediums, as a documentary and then as a graphic novel. You sift through the details and sharpen the focus. What happens, once you have a graphic novel of this caliber, is that you find a greater truth. You have here a straightforward cadence as the story is presented in comics. The layout foundation on the page is two panels on three rows with variations as needed. This is classic comics storytelling and it works quite well. You don’t need much else in many cases. For this story, this framework sort of mimics the camera in a documentary and evokes reportage in general. In fact, you don’t really notice the panel structure as you are immersed into action. Again, Shadmi does a remarkable job with bringing to life these characters. And, as you’ll see yourself, this graphic novel does a remarkable job of clearing away the clutter and getting to the heart of the matter. You see here Mike’s Place become the center of conflict. A happy-go-lucky gathering spot, seemingly existing out of time and place, comes crashing down. This is the story of such a place. And how people come together once the unthinkable has happened. 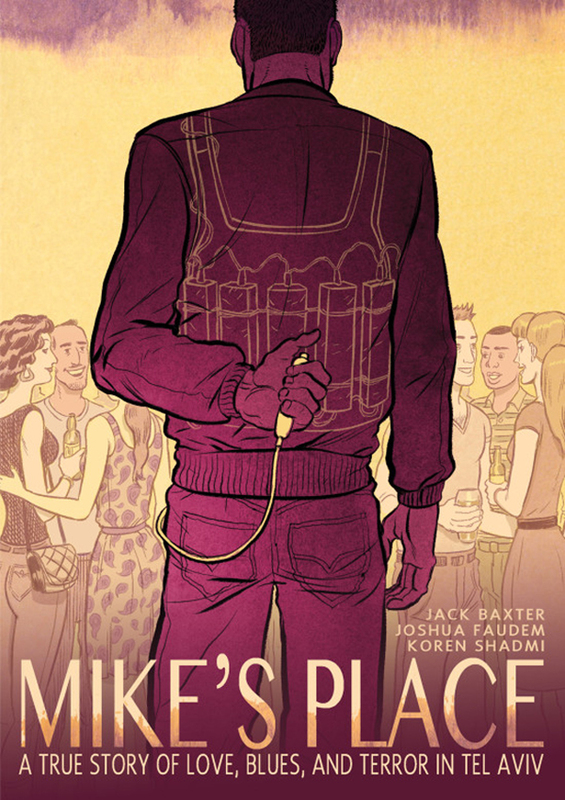 “Mikes’ Place” is a 192-page hardcover published by First Second Books. For more details, visit our friends at First Second right here. You can also find this book here, here, and here. If you are in the Seattle area, be sure to stop by Fantagraphics Bookstore and Gallery this Saturday, June 13, and meet the book’s cartoonist, Koren Shadmi. This will be a fun event which includes the debut of a new book by local cartoonist, Greg Stump, “Disillusioned Illusions,” published by Fantagraphics. For more details, go right here. Wow. An interesting departure from the usual escapism offered by the comic medium. This is all relative, depending upon who you talk to. In other words, as you know, the world of comics is so big now that past labels don’t apply. There’s just so much out there to choose from, which is great, of course. I’m glad you enjoyed the review.